Previously, Kotaku introduced an incredibly difficult-looking maze that a father created over thirty years ago for his daughter. The drawing took the father seven years. Now, three decades later, he's begun another one. 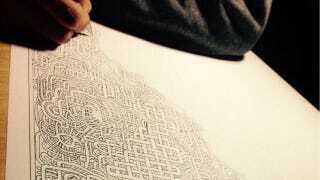 A Father Took Seven Years to Draw This Maze. It Might Be Impossible to Clear. Twitter user Kya7y says her father is aiming to make a maze that is "more beautiful and easier to complete." She added the hashtags #娘として完成が楽しみである #また7年かかるのだろうか which mean, "#As the daughter, I'm looking forward to its completion" and "#Is this going to take another seven years?" So far, the in-progress maze looks both challenging and beautiful. The above image has been retweeted nearly seven thousand times. In case you don't remember the earlier maze Kya7y shared, you can see that below. It is so difficult that apparently even she wasn't sure if it was possible to reach the goal.